Update 3.30.11: Well the acquisition of Radian6 by Salesforce.com certainly ties into this post. Sometimes we get a good answer, but often it’s not a clear answer. If the organization has an existing methodology in place to measure the effectiveness of programs, why not try to plug into this existing system? It’s not always easy though. There is no lack of data and tools to document activities on external social networks, but what we focus on is crossing the membrane intact. 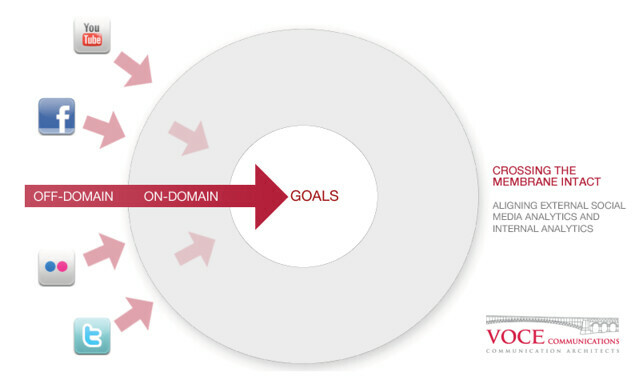 Going from off-domain to on-domain and aligning the data to give real insights and value. The internal/existing measurement problem is either rooted in technology, or communication. We often see the communication issue. The corporate communications team isn’t always in constant talks with the analytics team and may not know the depth of measurement available to them. While the social media industry moves forward with new services and richer analytics, linking them back to internal systems is still a hit or miss proposition. Services like WebTrends and Salesforce are paving the way to link on-domain and off-domain activities into a single view and the hope is more vendors get very serious in this space. The problem is stated in a simple question: How effective is social media compared to other traditional forms of communication? Let’s try to look at the data….if it’s available. The majority of the time social media wins by default since there is more data available, but it’s not always a fair fight. This get’s back to my post from yesterday, we work off the data we have available, and not the data we don’t have. I think your comment about linking social media services and analytics to internal systems hits the nail on the head in regards to the Salesforce acquisition. Seems to be a lot of sales people using social media monitoring for lead gen and wanting an effective way to tie that into their existing traditional CRM platforms. I would guess that’s one of the motives for Salesforce acquiring Radian6. It’ll be interesting to see how/if they integrate it somehow. And that could tie into measurement that really moves sales – tracking sales leads and revenue via social media.